Soylent is a blend of vitamins and nutrients sold as a liquid meal replacement drink. 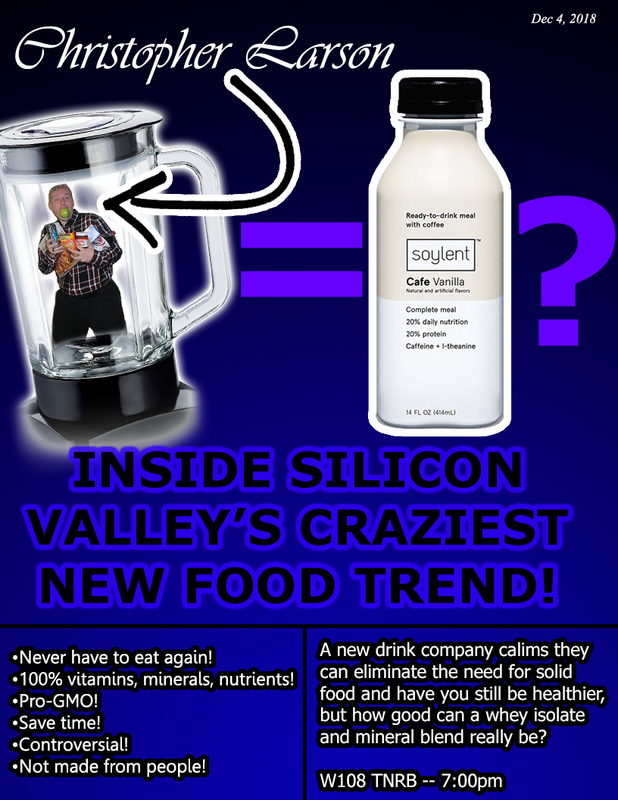 Soylent tends to spark controversy among many, so I sought out to clear up some of the mysteries regarding Silicon Valley's favorite food. [i] Rosa Foods. "Soylent FAQ." Soylent. 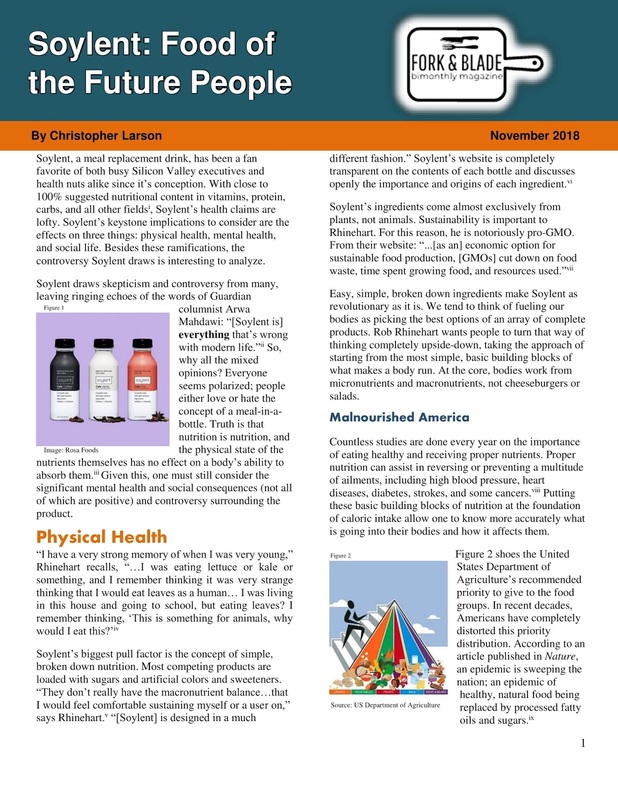 Accessed November 10, 2018. https://soylent.com/pages/faq. [ii] Mahdawi, Arwa. "I Tried Soylent, Silicon Valley’s Favourite Foodstuff. It’s Everything That’s Wrong with Modern Life." The Guardian, September 11, 2018. 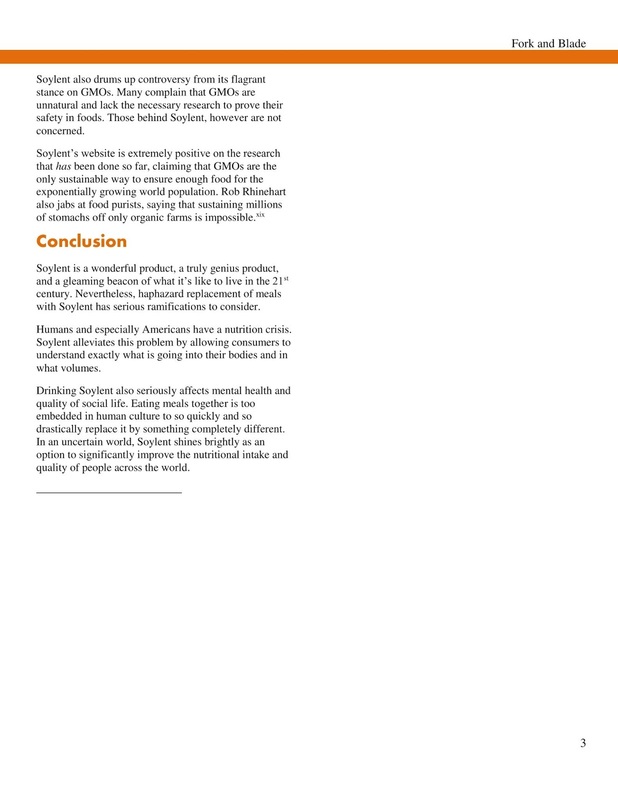 Accessed November 2, 2018. https://www.theguardian.com/commentisfree/2018/sep/11/i-tried-soylent-silicon-valleys-favourite-foodstuff-its-everything-thats-wrong-with-modern-life. [iii] Grover, Zubin, and Looi C. Ee. "Protein Energy Malnutrition." Science Direct56, no. 5 (October 2009). https://www.sciencedirect.com/science/article/pii/S0031395509000868?via=ihub#! [iv] Merchant, Brian. "Soylent: How I Ate No Food For 30 Days." Motherboard, November 11, 2013. Accessed November 2, 2018. https://motherboard.vice.com/en_us/article/539bpd/soylent-how-i-stopped-eating-for-30-days. [v] Ziegler, Chris. "Soylent 2.0 Is Bottled, Ready to Drink, and Made from Algae." The Verge, August 3, 2015. Accessed November 10, 2018. https://www.theverge.com/2015/8/3/9088407/soylent-20-bottled-ready-to-drink-meal-replacement. [viii] Murray, Christopher, Marie Ng, and Ali Mokdad. "The Vast Majority of American Adults Are Overweight or Obese, and Weight Is a Growing Problem among US Children." IHME. Accessed November 2, 2018. http://www.healthdata.org/news-release/vast-majority-american-adults-are-overweight-or-obese-and-weight-growing-problem-among. [xi] Grover, Zubin, and Looi C. Ee. "Protein Energy Malnutrition." [xii] Mayo Clinic. "Seasonal Affective Disorder (SAD)." 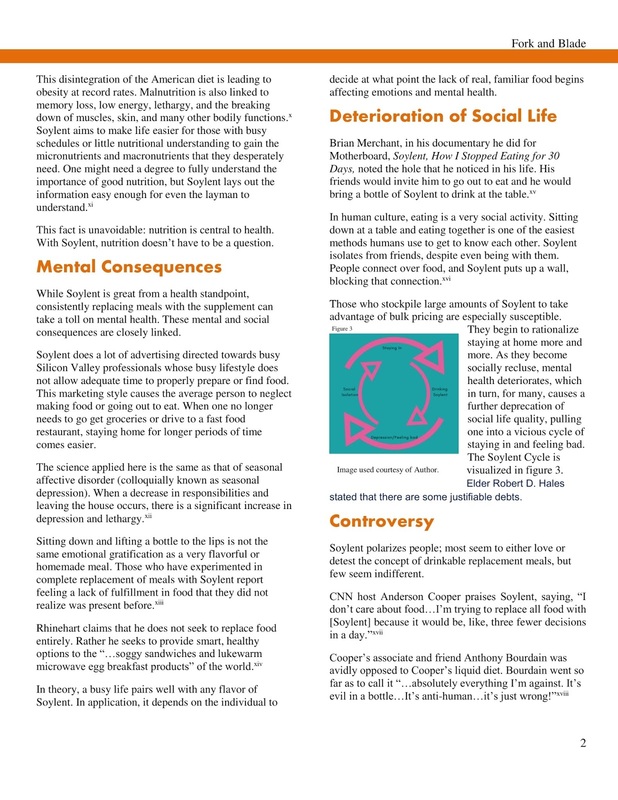 Accessed November 10, 2018. https://www.mayoclinic.org/diseases-conditions/seasonal-affective-disorder/symptoms-causes/syc-20364651. [xiii] Merchant, Brian. "Soylent: How I Ate No Food For 30 Days." [xv] Merchant, Brian. "Soylent: How I Ate No Food For 30 Days." [xvi] Zilber, Ariel. "'I Don't Care about Food': Anderson Cooper Reveals He Is Trying to Replace All His Meals with Soylent While Giving a Rare Glimpse inside His $5M Converted Firehouse." DailyMail, September 13, 2018. https://www.dailymail.co.uk/news/article-6166373/Anderson-Cooper-replacing-meals-Soylent-giving-glimpse-inside-converted-firehouse.html.